We’d love your help. Let us know what’s wrong with this preview of The Future of Humanity by Michio Kaku. The #1 bestselling author of The Future of the Mind brings us a stunning new vision of our future in space. Human civilization is on the verge of spreading beyond Earth. More than a possibility, it is becoming a necessity: whether our hand is forced by climate change and resource depletion or whether future catastrophes compel us to abandon Earth, one day we will make our h The #1 bestselling author of The Future of the Mind brings us a stunning new vision of our future in space. To ask other readers questions about The Future of Humanity, please sign up. Why is Stephen Hawking not mentioned in Acknowledgements, despite having been mentioned in the book multiple times? I don't think it's possible for Michio Kaku to write a book that I don't absolutely love. Dark matter, antimatter, space travel, black holes, laser-propelled nanoships, quantum physics. String theory!! What is there not to love?? Much of this book is speculation and yet as always with Mr. Kaku's books, I learned quite a lot. He uses physics to speculate where we might be in the future, both near and far. He discusses inter-planetary travel and terra-forming other planets, not just in our own solar system but beyond. He discusses the future of our earth, our solar system, our galaxy, the universe. How might an advanced Typel IV civilization survive the Big Crunch, when our universe collapses? How can we apply String Theory to the notion of a multiverse and the possibility of leaving this universe for another younger one? Before that happens, how might we seed this universe with intelligent life, becoming pure energy beings in the process and darting about from star to star? These and so many other topics are discussed and speculated upon in The Future of Humanity. Anyone interested in astrophysics, technology, or just the future should find this book fascinating. At times it almost seems like science fiction, and so I think any sci-fi lovers who tend to not read non-fiction might even love this book. I should really be appealing to the 5th Dimension Organic Masters who push the buttons of the AI Overlords who keep our computer simulation running, despite them being blissfully unaware of their 5th dimension AI Overlords, who haven't got the foggiest about their 6th Dimension Organic Masters. Her Noodly Majesty l If you're into stuff like this, you can read the full review. In other words, our destiny is to become the gods that we once feared and worshipped. Science will give us the means by which we can shape the universe in our image. The question is whether we will have the wisdom of Solomon to accompany this vast celestial power. I haven't read a non-fiction novel in more than 2 years. I don't even remember how I stumbled upon this novel. I even tried searching my browsing history to try and figure things out but apparently I just randomly searched it on ama In other words, our destiny is to become the gods that we once feared and worshipped. Science will give us the means by which we can shape the universe in our image. The question is whether we will have the wisdom of Solomon to accompany this vast celestial power. I haven't read a non-fiction novel in more than 2 years. I don't even remember how I stumbled upon this novel. I even tried searching my browsing history to try and figure things out but apparently I just randomly searched it on amazon kindle to check if it was on sale. I guess it would either be here on goodreads or on reddit considering I've been spending an unhealthy amount of time there lately. Astrophysics, Cosmology, Terraforming, Science Fiction, or anything about Space you can throw at me and I will catch it with utmost eagerness. These topics have been a huge interest of mine ever since and whilst I don't dwell much on it or try to really dig deep and learn the stuff, I am keen to slowly learn the stuff. I never hated Physics, in fact, I actually enjoyed it but not enough to really consider having a future in astrophysics. My love for Chemistry and Biology prevailed and in result here I am, about to start my second year in medicine in a few weeks. Regrets? Not really, but books like this really make me rethink my life decisions even by a little bit. I am beyond grateful for discovering this book. I was supposed to read a Sci-Fi novel about Space but ended up choosing this instead. Another major factor was that it was readily available in my local bookstore, in hardcover, so I grabbed it right away. Never in my life have I looked forward to reading a non-fiction book. Even Stephen King's On Writing took me a few days to read (4 I think?) but this barely made 3 days. If it wasn't for my tooth extraction and post-op pain, I would've devoured this in a day. I lost track of time and my attention span suddenly was amazing while reading this novel. I haven't experienced this in years. Michio Kaku tackled on multiple important topics in this novel. As the title says, it's major focus lie on Terraforming, Interstellar travel, theories on the universe, theories on physics and the likes, and well, the future of humanity. Don't we all love a good Sci-Fi book, movie, or TV Series here and there? Well, this novel briefly yet successfully explains the rationale regarding most of the Sci-Fi things you've encountered. You see, Science Fiction, while fiction, is an author's way of depicting what could happen in the future. While not all of them are plausible or scientifically correct, some if not most of them are actually possible. I will not discuss anything in detail or at all in this review cause most of the topics are briefly discussed and I don't wanna be a spoiler to anyone. If you're familiar with The Flash, Dark Matter, and well, most of the books, movies, and TV series out there about time travel and space, this novel explains what happens when you mess with the universe. I was most impressed with how he explained the multiverse, and how it was actually at parr with The Flash/DC's explanation. Well, DC is known to be heavily Science-inclined as compared to Marvel and I'm glad that they didn't get it wrong this time. I am also fascinated with the theories of what could happen in the future. I'm glad he tackled on possible fates for the universe and not just humanity itself. I didn't know most of the projects out there today and I am fascinated and interested to know more about them. The problem with not reading much Science Non-Fiction novels is that I'm not sure how good this novel actually is, especially for voracious readers of the genre and most especially of those in the academe and scientists. I may not be the best source to know if this novel is reliable scientifically, but I can say that the author provided adequate explanations to strengthen his claims. I have yet to read the Elon Musk book out 3 years ago that is still sitting on my shelf collecting dusk with no acceptable reason why. While I am not the biggest fan of Mars (thanks to my hatred for John Carter of Mars when I was younger), I am immensely interested in Terraforming. I do believe that we will achieve it in the near future with billionaires and scientists working on it. It's also great how near the end of the novel, String Theory was heavily discussed. I used to be addicted to The Big Bang Theory and how Sheldon Cooper chose String Theory as his main focus of study. I vaguely remember a character said that it's sad that Sheldon chose a field where it's well, a dead end. It was Leonard I think? I'm not sure but it's great how I was finally introduced to it aside from the vague things I got from The Big Bang Theory. Since I've rekindled my love for this genre, I will read more on it. In fact, I've already ordered some books regarding Moon exploration, terraforming, and other books of this amazing author. The starting signal for the unlimited spread of the human species and the essence of science fiction. As it was often the case in its history, humanity is at the beginning of a new epoch. With the striking difference that there are for the first time no limits. The purpose of the colonization of space is well suited to illustrate the minuteness of the earth. It is not even a quantum state in The starting signal for the unlimited spread of the human species and the essence of science fiction. As it was often the case in its history, humanity is at the beginning of a new epoch. With the striking difference that there are for the first time no limits. The purpose of the colonization of space is well suited to illustrate the minuteness of the earth. It is not even a quantum state in relation to the known and unknown totality of things. No matter in which relation one sets the size of the solar system to the potential infinity. More and more dimensions of space open up if one puts it in a historical connection. From a small camp to a larger village to a small town over the city-state and the principality to states and finally the colonization. With the difference that this time no illiterate extremists, but educated experts form the spearhead of the expansion wave. Good, because the deluded ancestors would probably slaughter each other in the cabin fever or out of boredom due to lack of other victims on the travels to infinity. The Sci-Fi component boosts the nitro in the third part, in which the binding genetic adaptation of humans to new worlds of life is discussed. As seen in the first and second chapters with the terraforming of the Moon, Mars, and more distant star systems, adapting the environment is a mammoth task. And economics will have to be written larger in the universe to survive. Even if one has relatively pleasant rock planets in relation to the hostility of the universe and other worlds. The faster and easier way will be to adapt people to their worlds instead of turning everything into a monoculture of new earthes. Still the creation of methane-metabolizing, acid-resistant, and photosynthetic-living people may let sweat drips appear on the face of even the most dedicated bioengineer. But even immortality, dimensional portals and time travel seem to be only a simple question of development time. All eggs in a basket is so anachronistic. And given the diverse natural and self-made potentials for extinction events, it seems logical to go higher and further. Alone because even if one does not sympathize with humanity in general, at least to one's own children and children's children a plan B is owed. And in the face of potentially erratic experiments on Earth, climate collapse, volcanic eruptions, comical catastrophes, alien invasions, financial crises, infertility epidemics and consorts, time is hard. Bad enough that humanity has easily overslept a few thousand years of technological development. Thanks to fanaticism and backlashes. What hypothetically implies that in the best chase scenario humanity could technologically be at the level of the year 7018 or even 12018. It may be, in a parallel world. Even now, in the long-delayed step towards the stars, the state is slowing down in the form of the cancellation of subsidies, space programs and a lack of funding of young talents. In Europe and North America, private companies are entering this empty space, while in China and India, state space programs shed light on the ignorance of the West. Maybe the last ones may be the first in a philosophical sense. But being so ignorant and destructive with the key factor of the future is a disgrace to the West. Moreover, because the supremacy has existed 50 years ago for strategic military reasons to the enforcement of mutually assured destruction, first strike concepts, megadeath, and similar confusions. And since then was dismantled because of the lack of necessity of a third world war. Although these are not a few thousand years lost as in general human development, it is still half a century of wasted potential. Kaku sees himself standing on the shoulders of two groups of titans. Once the theoretical basis in the form of scientists and on the other side, the visionary power of creative minds such as writers, filmmakers and humanities scholars. One would have to search with the magnifying glass to find a forgotten Sci-Fi trope that is not mentioned in the book. Ok, maybe except aliens and interstellar wars. But to get to know the number of concepts, technologies, drives, sciences, etc., some Sci-Fi novels are needed otherwise. So Kaku drives the imagination and fantasy of young professionals from both sectors. Help with finding ideas and brainstorming for new books, films and video games, which arouse first interest in research and science in millions. And impulses and food for thought for aspiring researchers. Futurism comes to its full potential if additional facts from Kaku's other works are included in the considerations and a few bits from encyclopedias are included. The scenario can be compared with "Physics of the Future" to be able to make conservative appraisals for the 21st century. If one looks into the distance, one gets into the hypotheses of his works "The Future of the Mind" and "Physics of the Impossible." Both, the incomprehensibility of human consciousness and the definition of feasibility, may lose the nimbus of impracticability over time. This opens up the space for all thought buildings and utopias. Only the latest scientific findings prove our enormous lack of knowledge. In particular, the various branches of physics, but also anomalies observed in animals, plants and even elements with ever more excellent measuring and observation techniques. Not a door opens behind every supposedly answered question, but on the contrary, more new mysteries are revealed. Even if one day we had explored all the dimensions, layers, and interactions of our universe, it would be possible to jump into unknown spheres at any time. With entirely different blueprints of reality, perception and the laws of nature, so that exploration can begin again at zero. A nice idea. Wie schon oft in ihrer Geschichte steht die Menschheit am Anfang einer neuen Epoche. Mit dem eklatanten Unterschied, dass es das erste Mal keine Grenzen mehr gibt. Das Vorhaben der Allkolonialiserung eignet sich gut zur Veranschaulichung der Winzigkeit der Erde. Sie ist nicht einmal ein Quantenzustand in Relation zu der bekannten und unbekannten Gesamtheit der Dinge. Egal, in welche Relation man die Größe des Sonnensystems zu der potentiellen Unendlichkeit setzt. Immer neue Dimensionen von Weite tun sich auf, wenn man es in eine geschichtliche Relation setzt. Aus einem kleinen Lager zu einem größeren Dorf in eine kleine Stadt über den Stadtstaat und das Fürstentum zu Staaten und schließlich der Kolonialisierung. Mit dem Unterschied, dass diesmal keine analphabetischen Extremisten, sondern gebildete Experten die Speerspitze der Expansionswelle bilden. Gut, weil sich die verblendeten Vorfahren auf den Reisen in die Unendlichkeit mangels anderer Opfer wahrscheinlich im Lagerkoller oder aus Langeweile gegenseitig abschlachten würden. Den Nitroboost zündet die Sci Fi Komponente ab dem dritten Kapital, in dem die verbindliche genetische Adaptierung der Menschen auf neue Lebenswelten angeschnitten wird. Wie man im ersten und zweiten Kapitel anhand der Terraformung von Mond, Mars und entfernteren Sternensystemen gesehen hat, ist die Anpassung der Umwelt eine Mammutaufgabe. Und Ökonomie wird im All noch größer geschrieben werden müssen, um zu bestehen. Selbst wenn man, in Relation zur Lebensfeindlichkeit des Alls und anderer Welten, relativ friedliche Gesteinsplaneten hat. Der schnellere und einfachere Weg wird eine Anpassung der Menschen an ihre Lebenswelten sein, anstatt alles immer zu einer Monokultur von neuen Erden zu verwandeln. Noch mag die Erschaffung von Methan metabolisierenden, Säure resistenten und von Photosynthese lebenden Menschen selbst dem engagiertesten Bioingenieur Schweißtropfen auf die Stirn treiben. Aber selbst Unsterblichkeit, Dimensionsportale und Zeitreisen scheinen angesichts dessen auch nur mehr eine nüchterne Frage der Entwicklungszeit zu sein. Alle Eier in einem Korb ist so anachronistisch. Und angesichts der diversen natürlichen und selbst gemachten Potentiale für Extinktionsereignisse scheint es logisch, höher und weiter zu streben. Allein weil man, selbst wenn man mit der Menschheit im allgemeinen nicht sympathisieren sollte, zumindest den eigenen Kindern und Kindeskindern einen Plan B schuldet. Und angesichts von potentiell schief gehenden Experimenten auf Erden, Klimakollaps, Vulkanausbrüchen, komischen Katastrophen, Alieninvasionen, Finanzkrisen, Unfruchtbarkeitsepidemien und Konsorten tut Zeit Not. Schlimm genug, dass die Menschheit locker ein paar Tausend Jahre technologischer Entwicklung verschlafen hat. Fanatismus und Backlashs sei es gedankt. Was hypothetisch im best Chase Szenario im Umkehrschluss bedeutet, dass die Menschheit technologisch auf dem Stand des Jahres 7018 oder gar 12018 sein könnte. Es, in einer Parallelwelt vielleicht ist. Selbst jetzt, im lange verzögerten Schritt zu den Sternen, bremst der Staat in Form der Streichung von Subventionen, Raumfahrtprogrammen und mangelnder Nachwuchsförderung. In Europa und Nordamerika springen private Firmen in die geschlagene Bresche, während in China und Indien staatliche Raumfahrtprogramme Licht auf die Ignoranz des Westens werfen. Vielleicht mögen die Letzen rein philophisch betrachtet die Ersten sein. Aber im Schlüsselfaktor der Zukunft derart ignorant und destruktiv zu sein ist eine Schande für den Westen. Noch dazu, weil die Vorherrschaft vor 50 Jahren aus militärstrategischen Gründen zur Durchsetzung von mutual assured destruction, Erstschlagskonzepten, Megatoten und ähnlichen Verwirrtheiten bestanden hat. Und seitdem aus mangelnder Notwendigkeit eines dritten Weltkriegs demontiert wurde. Das sind zwar keine paar Tausend verlorenen Jahre wie bei der menschlichen Entwicklung, aber trotzdem ein halbes Jahrhundert verschwendeten Potentials. Kaku sieht sich auf den Schultern zweiter Gruppen von Titanen stehen. Einmal die theoretische Grundlage in Form der Wissenschaftlicher und auf der anderen Seite die visionäre Kraft von kreativen Köpfen wie Schriftstellern, Filmemachern und Geisteswissenschaftlern. Man müsste schon mit der Lupe suchen, um eine vergessene Sci Fi Trope zu finden, die nicht Erwähnung findet. Ok, Aliens und interstellare Kriege vielleicht einmal ausgenommen. Aber um die Menge an Konzepten, Technologien, Antrieben, Wissenschaften, usw kennen zu lernen, sind sonst einige Sci Fi Romane vonnöten. So treibt Kaku die Imagination und Fantasie von Nachwuchskräften aus beiden Sektoren an. Inspiration und Ideenfindung für neue Bücher, Filme und Videospiele, die in Millionen erst das Interesse für Forschung und Wissenschaft wecken. Und Impulse und Denkanstöße für angehende Forscher. Zur vollen Entfaltung kommt der Futurismus, wenn man ergänzend Fakten aus Kakus anderen Werken in die Überlegungen mit einfließen lässt und noch eine Prise Enzyklopädien darüber streut. Das Szenario kann etwa für dieses Jahrhundert mit "Der Physik der Zukunft" verglichen werden, um konservativ Kolportagen über das 21 Jahrhundert anstellen zu können. Richtet man den Blick in weitere Ferne, kommt man in die Hypothesen seiner Werke "Die Physik des Bewusstseins" sowie "Der Physik des Unmöglichen." Wobei beides im Laufe der Zeit den Nimbus der Undurchführbarkeit verlieren dürfte. Sowohl die Unverständlichkeit menschliches Bewusstsein als auch die Definition von Machbarkeit. Damit eröffnet sich der Raum für alle Gedankengebäude und Utopien. Alleine die jüngsten wissenschaftlichen Erkenntnisse belegen unser enormes Unwissen. Insbesondere die diversen Teilbereiche der Physik, aber auch die mit immer feineren Mess- und Beobachtungstechniken beobachteten Anomalien in Tieren, Pflanzen, ja selbst schlichten Elementen. Nicht eine Tür öffnet sich hinter jeder vermeintlich beantworteten Frage, sondern es werden im Gegenteil mehr neue Mysterien offenbart. This is utterly fascinating and written in a way that was easy to understand. Kaku mixes science with fiction (pulled from pop culture, books, etc) in order to explain what could or couldn’t happen in the future. I was surprised how easy it was to grasp the ideas and loved the examples he gives. His love of science is evident in his writing and very contagious. I have another book of his that I’ve been hesitant to start (I was afraid it’d be over my head), but after reading this I’m eager to div This is utterly fascinating and written in a way that was easy to understand. Kaku mixes science with fiction (pulled from pop culture, books, etc) in order to explain what could or couldn’t happen in the future. I have another book of his that I’ve been hesitant to start (I was afraid it’d be over my head), but after reading this I’m eager to dive into it. I spent a couple of hours skimming and scanning Prof. Kaku's latest book, and I'm giving up on it. I'm not quite sure why I find his writing style so profoundly irritating. His information is generally correct -- although other reviewers call him out for some bloopers, which I didn't see. I guess it's because his grand ideas of the future of humanity just seem, well, tired and old-hat. He can take something that should be really cool, like the chances of some future civilization developing faste I spent a couple of hours skimming and scanning Prof. Kaku's latest book, and I'm giving up on it. I'm not quite sure why I find his writing style so profoundly irritating. His information is generally correct -- although other reviewers call him out for some bloopers, which I didn't see. I guess it's because his grand ideas of the future of humanity just seem, well, tired and old-hat. He can take something that should be really cool, like the chances of some future civilization developing faster-than-light travel, and make it sound dull. Mind, this may just be me. Lots of other people like the book. But I've tried Kaku's stuff in the past and had similar reactions. So I think I'm just allergic to his writing style. Oh, well. 1.5 stars, courtesy round-up. Your mileage may vary! while I did not enjoy this book, and definitely do not rec it to adults, if you have a bright 8-12 year old interested in science, get them this! "The origin of the moon has fascinated humanity for millennia. Because the moon rules the night, it has often been associated with darkness or madness. The word lunatic comes from luna, the Latin word for moon." (Kindle Locations 758-759). "Since the composition of the moon is so similar to Earth’s, the truth may be that mining the interior of the moon while I did not enjoy this book, and definitely do not rec it to adults, if you have a bright 8-12 year old interested in science, get them this! "Since the composition of the moon is so similar to Earth’s, the truth may be that mining the interior of the moon is only useful if you are building cities on the moon. It is probably too expensive to bring moon rock back to Earth if it only offers what we already have. "(Kindle Locations 787-789). "What would happen if you took off your space suit on the moon? Without air, you would suffocate, but there is something even more disturbing: your blood would boil . . . In other words, taking off your space suit on the moon could be a very unpleasant experience. Best to keep it on at all times." (Kindle Location 790- 808). I think the book was OK, I guess I was expecting something different. THIS is what I wanted Soonish: Ten Emerging Technologies That'll Improve and/or Ruin Everything to be, speculative science combined with hard facts and historic titbits about science development. Space travel has experienced a revival in the past few years thanks to billionaires like Jeff Bezos and Elon Musk, both setting their sights on accelerating space programmes. Does this mean every time I buy a book on Amazon I am indirectly contributing to space exploration? I like that idea. Just be warned there are a lot of sci fi books and movies mentioned (with spoilers) with the author showing a notable fondness for Star Trek and Isaac Asimov. I understand why he included these references but to be honest at times these references got a bit much. I also found the writing a little inconsistent, going from light and breezy to tackling quite complex theoretical physics, but at no point did I want to stop reading it. My favourite sections were science history, biotechnology and current astrophysics discoveries and laser nanoships. The last 60 pages or so dealt with string theory and try as I may my small brain still struggle to grasp the concept of a 10-dimensional multiverse. This is a meticulous outline of “What If” scenarios grounded in past and current space developments. It was interesting, fun and I definitely learned a few things along the way. “The Future of Humanity” is an awe-inspiring exploration of the pioneers who have the energy, vision, and the resources to change the fate of humanity. He also analyzes the advance in technology that will make it possible to leave the Earth and settle elsewhere. Cofounder of string field theory, best-selling author and professor of theoretical physics at the City University of New York, Dr. Michio Kaku takes the reader on a unique journey beyond Earth. This splendid 352-page book includes fourteen chapters broken out by the following three parts: I. Leaving the Earth, II. Voyage to the Stars, and III. Life in the Universe. 1. A Kaku trademark, great science writing for the general public. Informative, interesting and fun to read. 2. The fascinating topic of the future of humanity in the hands of an expert. 3. Excellent format. The book is broken out logically and in chronological order of future events. Also, each chapter is introduced by chapter-appropriate quotes. 13. One of the joys of reading Kaku are the numerous references to popular science fiction movies that help readers understand science topics. Movies like Passengers, Interstellar, Arrival and of course the classic 2001 get a lot of love. 1. I would have preferred a better laid out book. I would have added timelines, highlight factoids, and take advantage of linking capability in eBooks. Time to take these books to another level. 2. Limited visual supplementary material for such a great narrative. 3. Honestly, how many readers even at its most basic will truly understand string theory? 4. Let’s be honest it’s hard to live up to the The Future of the Mind. 5. In order to reach a broader audience, depth pays a price. In summary, I really enjoyed this book! Kaku is the tour guide you want to teach us about the future of humanity. This is what popular science writing should all be about, inspiring minds to dream big while keeping us grounded in sound science. What makes this book a treat to read is the combination of Kaku’s mastery of the topic, his enthusiasm, his ability to convey complex topics in an accessible manner, and providing readers with excellent examples from popular science fiction movies. Some shortcomings aside, I highly recommend it! This was a fascinating piece of speculative non fiction that explored how humans might move beyond earth and eventually expand into the universe. I found some of the information incredibly basic so I wouldn't necessarily recommend this book to readers with a lot of science background. However, I think this will appeal to readers with a fairly simple understanding of space who are interested in learning more about the topic. A fun, yet tedious asides about the multitude of possibilities for future human evolution. Not overly dense, but enjoyable as a whole. Theoretical physicist Michio Kaku is at his best (at least for layman) when his enthusiasm for creative science, science fiction, and the edges of our knowledge blend into a surprisingly accessible read. That approach comes through much of The Future of Humanity, where his speculative science is sometimes quite compatible with speculative fiction. This one's a little different from Hyperspace; there's less of Kaku's own work and more of his reporting on the work of others, whether as historical o Theoretical physicist Michio Kaku is at his best (at least for layman) when his enthusiasm for creative science, science fiction, and the edges of our knowledge blend into a surprisingly accessible read. That approach comes through much of The Future of Humanity, where his speculative science is sometimes quite compatible with speculative fiction. This one's a little different from Hyperspace; there's less of Kaku's own work and more of his reporting on the work of others, whether as historical overviews or updates on contemporaries. When the book drags, which isn't often, it's because it bogs down in reportage. The ideas here are fun, even if the premise (we have to leave earth or face extinction) is bleak. Some of the science never quite gets there, and some of the timeline estimates feel unfounded (maybe they aren't, but some of them are more clearly explained). Figuring out how to travel the stars feels like an exercise in fiction with Kaku's easy approach to physics, but understanding that these ideas are (mostly) actual considerations adds an odd feeling to it. I imagine this one's as good a read for fans of Arrival or Asimov as it is for fans of Brian Greene. Those looking for harder, more detailed science won't find it here, but will likely still find Kaku's musings engaging. 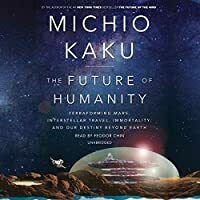 I received a free Kindle copy of The Future of Humanity by Michio Kaku courtesy of Net Galley and Doubleday Books, the publisher. It was with the understanding that I would post a review to Net Galley, Goodreads, Amazon, Barnes and Noble and my nonfiction book review blog. I also posted it to my Facebook, LinkedIn, Twitter and Google Plus pages. I requested this book as I have always had an interest in space and science and where we may go in the future. 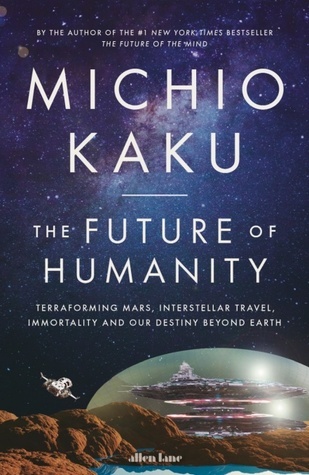 This is the first book by Michio Kaku tha I received a free Kindle copy of The Future of Humanity by Michio Kaku courtesy of Net Galley and Doubleday Books, the publisher. It was with the understanding that I would post a review to Net Galley, Goodreads, Amazon, Barnes and Noble and my nonfiction book review blog. I also posted it to my Facebook, LinkedIn, Twitter and Google Plus pages. I requested this book as I have always had an interest in space and science and where we may go in the future. This is the first book by Michio Kaku that I have read. The subtitle of this book "Terraforming, Mars, Interstellar Travel, Immortality and Our Destiny Beyond Earth" is a good description of the contents of the book. The author starts out describing what will eventually happen to the Earth using other solar systems as examples. He then launches into a number of topics dealing with the subject. The author's writing style is engaging making this an enjoyable read. While the author does project his thoughts on the subject, he also uses the thoughts and theories of several others. Some of his time frames for events are well documented while others are somewhat more nebulous. I love Dr Strangelove Mr Kaku :) but this book is proof of the trend observed with Pinker: take a popular topic, research all the news in the last 10 years and make a book about it. Well is good but his youtube videos are even better. Kaku will be remembered for his sweet voice saying: "in the future" and that what he is, a dreamer. Climate change. The threat of thermonuclear war. Bioterrorism. Overpopulation. Is it any wonder that most Americans today are pessimistic about the future of the human race? In the face of all these (and so many other) existential threats to the survival of our civilization, who can blame us for wondering whether our grandchildren will live to see the 22nd century? Yet there are those who sail against the prevailing currents of thought and see a future that is endlessly bright. To this brave cad Climate change. The threat of thermonuclear war. Bioterrorism. Overpopulation. Is it any wonder that most Americans today are pessimistic about the future of the human race? In the face of all these (and so many other) existential threats to the survival of our civilization, who can blame us for wondering whether our grandchildren will live to see the 22nd century? Yet there are those who sail against the prevailing currents of thought and see a future that is endlessly bright. To this brave cadre of optimists we can now add physicist Michio Kaku, who peers hundreds of thousands of years into the future, envisioning human civilization spread throughout the galaxy in his dazzling new book, The Future of Humanity. Read this book, and he will take you on a journey from the moon and Mars to the multiverse. Professor Kaku’s prescription is unambiguous: “Either we must leave the Earth or we will perish. There is no other way.” In this judgment, he has a lot of company. The late Stephen Hawking and Elon Musk, for example, not to mention many other prominent scientists and technologists (and a handful of politicians) who see humanity’s future in the stars. Yet none of these individuals view the future through the rose-colored glasses of faith alone or science fantasy. Their conviction is grounded in solid scientific research. Kaku makes that overwhelmingly clear in his considered, step-by-step presentation of the steady progression of the human race, first back to the moon, Mars, and the asteroids; then to the moons of Jupiter and Saturn; and finally onward to the nearest stars, with stopovers on the comets that swarm by the millions in the vast Oort Cloud that surrounds the solar system. This is truly a journey from the moon and Mars to the multiverse. The Future of Humanity is divided into four parts. In the first, Kaku takes us along to witness the establishment of a permanent base on the moon and the settlement and terraforming of Mars. In part two, we accompany him as humanity moves beyond the solar system to explore the nearby stars. Part three concerns the settlement of extrasolar planets, dwelling on the genetic changes that will be required for humans to adapt to the daunting conditions so likely to be found there. The author’s argument is easy to follow throughout most of his book. His explanations of scientific phenomena are remarkably clear, using an abundance of pithy similes and metaphors. Only in the final chapters when he attempts to explain string theory (his specialization) and the more fanciful imaginings of cosmologists does Professor Kaku’s language become opaque. String theory “contains an infinite number of parallel universes, called the multiverse, each one as valid as the next.” In ten dimensions. Everything covered was entertaining, yet the book ultimately suffers from being overly general. Wanted scientific detail and came away with repackaged sci-fi. Maybe that’s inherent in speculative nonfiction. Excellent book about what we need to do to leave Earth and spread between stars. I had a mild lacrimal event of joy when I finished this book. I enjoyed reading that book. While I don't agree with some of the author's views on the future of humanity, the book is very well written in an engaging style. I am now excited to dig more into string theory and super symmetry. This is a hastily written popular book with a catchy title but only with a host of rehashed ideas and no novel lines of thoughts or conclusions. The short book starts by excessively focusing on the latest developments in the space travel. For a book with such a wide scope, the initial chapters - that detail the cold war space race, NASA's history, Musk/Bezos' programs and many other technical details of where space travel is today - are wasted and a harbinger of the confusion that permeates all t This is a hastily written popular book with a catchy title but only with a host of rehashed ideas and no novel lines of thoughts or conclusions. The short book starts by excessively focusing on the latest developments in the space travel. For a book with such a wide scope, the initial chapters - that detail the cold war space race, NASA's history, Musk/Bezos' programs and many other technical details of where space travel is today - are wasted and a harbinger of the confusion that permeates all through the book. The author is talking about the future, and as a result, is expected to hedge any forecasts, but its the failure to define the objective that hurts the book the most. As we know, one day, our earth, solar system, galaxy and even the universe will end. The author's future of humanity is linked to how we deal with these catastrophes. For sure, there is some discussion about AI, transhumanism, genetically modified life-spans, a potential man+machine age or even man-made disastrous spirals (pollution, nuclear), but the discussions on these subjects are perfunctory and not even newspaper article length. The author completely skips how this could shape our social, economic or political lives. In their place, he has long discussions on scientific factors that would determine various scenarios for our galaxy, sun and the earth, while relatively short, speculative conclusions on the way humanity or post-human intelligence would escape it.